Download Carbon Poker to take part in the exclusive 15K Carbon League which kicks off on Tuesday October 11 and culminates in the Big Final on January 8, 2012. The 15K Carbon League is set to be one of the best value tournament series on offer towards the end of this year. Not only will players have the opportunity to win cash prizes in a range of weekly tournaments, but players will also accumulate league points throughout the series which will go toward qualifying for the final event which features a massive $10,200 prize pool thanks to Carbon Poker and PokerNews. There will be three types of tournaments on offer during the league period, with two weekly cash buy-in events and a slew of freerolls featuring only a 50 Carbon VIP point buy-in, ensuring every player has a chance to accumulate enough points to make their way to the Big Final in January. Every Tuesday at 18:00 GMT: $3+0.50 buy in with league points on offer and $50 added to the prize pool. 50 Carbon VIP point buy-in with a huge amount of league points on offer and $1,000 added prize pool. While the weekly Carbon League tournaments feature tremendous value on their own merit, players will have their eyes set on accumulating enough league points to qualify for the Big Final in January and claiming their share of the $10,200 added prize pool. The weekly league tournament held on Tuesdays features a league point structure as shown below, while the weekly Friday tournament awards double the points of below. Be sure to not miss out on the three freerolls on offer throughout November and December as not only do those tournaments feature a $1,000 added prize pool, but they also award more league points than any of the weekly tournaments, with 120 league points going to the winner, paying points in generous intervals down to 5 points for a 15th place finish. At the end of the league period the top 30 players from the league will qualify to take place in the $10,200 Big Final on January 8 at 18:00 GMT, with 15 players being paid for their efforts. This means that an astounding half the players in the field will be awarded at least $100 and could take home up to $2,250. 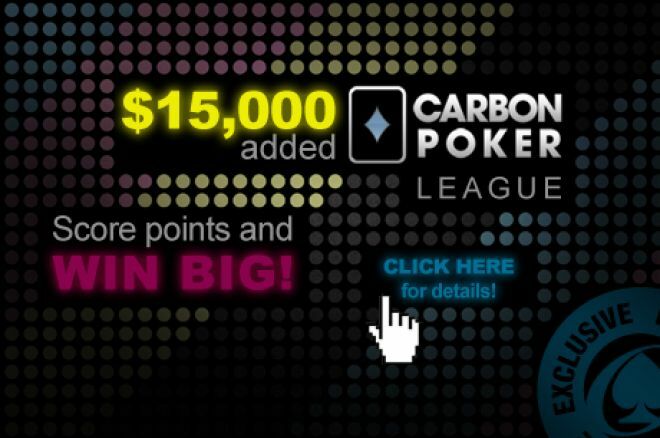 The 15K Carbon League is exclusive to PokerNews players, so if you haven’t already opened a Carbon Poker account through one of our links download Carbon Poker now and prepare to start accumulating league points! Don’t forget our Carbon Poker bonus where players will receive a 150% bonus up to $750 on their first deposit when they sign up through our links using the bonus code ”POKERNEWS”.